Camping and traveling are fun and easy with the Jayco Eagle HT 29.5BHDS! This 5th Wheel is geared up and ready for the road! Here at Tradewinds RV Center, we offer incredibly low prices on all the most popular, top brand RVs! 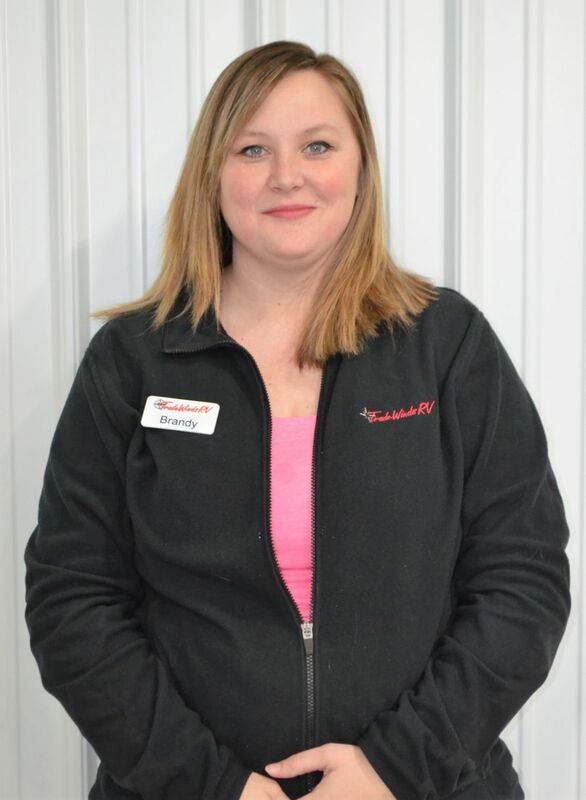 If you're driving by Clio, stop in at 4325 W Vienna Rd Clio Michigan 48420 and feel free to browse our huge inventory! 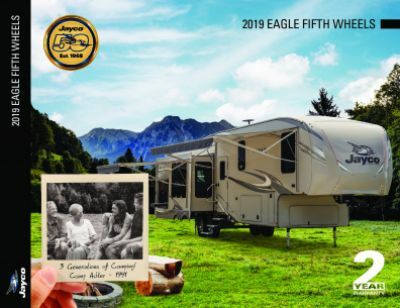 Call us at 810-686-0710 today and our knowledgeable, friendly RV experts will be glad to help you learn all about this 5th Wheel and how you can own it at a price that will amaze you! You'll save $1000s! And we've got great financing, too! No matter where you live, our fast, reliable 24/7 delivery anywhere in North America, means your dream RV will be at your door in no time! This 5th Wheel has a hitch weight of 1715 lbs. and a GVWR of 10995 lbs, making it easy to tow and sturdy enough for the whole family - and more! Stay cool in the shade of the 19' 0" patio awning. Step into the master bedroom and you'll find a lovely Queen bed! 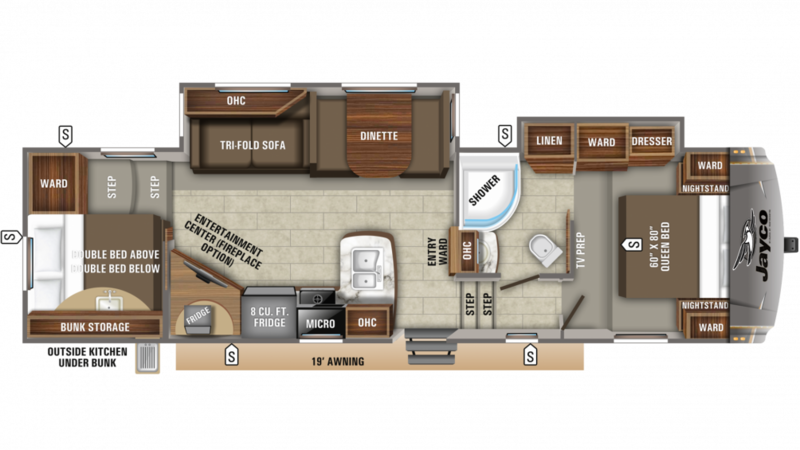 There are comfortable sleeping accommodations for up to 10 people in this 5th Wheel. When it's time to cook up a delicious meal for your family, that's when you'll be glad you're on the road in the Jayco Eagle HT 29.5BHDS! It has a modern, roomy kitchen with great cooking appliances, including a 3 burner cooktop. And the 8.00 cu. ft. refrigerator can stock all your favorite fresh foods and beverages! The 43 gallon freshwater tank means you won't run out of clean water anytime soon! With the spacious shower, 43 gallon freshwater tank, and hefty 60 lbs. of LP tank capacity in this RV, everyone can enjoy a refreshing hot shower in the handsome bathroom to start or end the day! The easy to use and sanitary Porcelain Foot Flush toilet will save that bothersome trip to the chilly, damp communal bathroom! The 65 gallon gray water tank and the 32 gallon black water tank discreetly store used and dirty water! At the end of every fun-filled camping day, nothing beats a great night's sleep so you can recharge your batteries for tomorrow. Luckily, there are comfy Bunkbeds in the bunkhouse! Kids or guests can ease off to dreamland every night, cozy and serene! Nothing beats the taste of food grilled outdoors, especially when you're having a picnic or tailgating before the big game. You can enjoy that treat anytime thanks to the handy outside kitchen! Burgers, brats, hot dogs, and more, they'll all have that great outdoor taste!